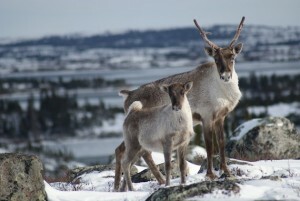 A survey conducted this summer by the Ministère des Ressources naturelles et de la Faune (MRNF), in partnership with the Government of Newfoundland and Labrador Department of Environment and Conservation, the Institute for Environmental Monitoring and Research and the Torngat Wildlife Board, shows that the George River caribou herd population has fallen to new lows. “The recent survey confirms an ongoing decline of the George River migratory caribou herd population over the past few years,” a recent news release from the MRNF said. This population is now estimated to be composed of 27,600 animals which represents about a third of the estimations of two years ago. In 2001 the population size was estimated to be around 385,000. “The results of this survey are very concerning and confirm our fears that we have not yet seen the bottom of this current decline, particularly when you consider this herd was estimated at 800,000 animals in the late 1980s,” said Terry French, Minister of Newfoundland and Labrador Government’s Department of Environment and Conservation, in a news release. Even if the exact cause of this spectacular decline is uncertain, changes in the quality and quantity of food is believed to be one of the driving factors. Other factors that might have contributed to this decline include predation, disease, parasites and climate change. Consultations between government, aboriginal groups and other stakeholders to seek input on the management of the herd are currently underway. Over hunting is not mentioned – has this been ruled out?? ?